I wanted to title this entry 'Vally' High, Hank Low, but it would be misleading because The New York Rangers beat the Philadelphia Flyers in shootout 5-4, thanks to backup goaltender Stephen Valiquette. Hmmm, that would be five out of six wins against the Philadelphia Flyers this season. Nothing 'Dark' about that! So with the Rangers winning four consecutive games in a row, we may be turning the corner now, finding ourselves in a winning streak extending the surge to 7-0-2. Currently we are only five points from first place in the ultra-competitive Eastern Conference and sit in seventh place below Boston and now two-points above Philadelphia. Looking back at the game, with the first period ending NYR 3, Flyers 3 - it was simply a 'free for all' -- a game without defense and, especially, a game without effective starting goaltenders. Henrik Lundqvist - in true Henk form - again demonstrated how scary a goaltender he can be as he submitted to three goals in only eight shots (by the way, he destroyed my weekly fantasy league standings in one God d*mn game) and was benched ending the first period. With our All-Stars and rookies actually scoring goals (and many of them), it is ironic that Lundqvist may be the stumbling block for the Rangers' future success this season. We know our defensive lines are inconsistent and learning (kids stopping big guys in the NHL), but of the three goals scored on Lundqvist two of them were 'soft' goals that should have been prevented. There are no more reasons why Lundqvist shouldn't be at the top of his game (i.e. father is recovering nicely, contract negotiations are complete, etc.) and we expect to see more from the 'King' we once knew. It is frustrating that there is no middle ground with Henrik - either you get the shutout or one-goal game, or you get the four or five goal letdown. 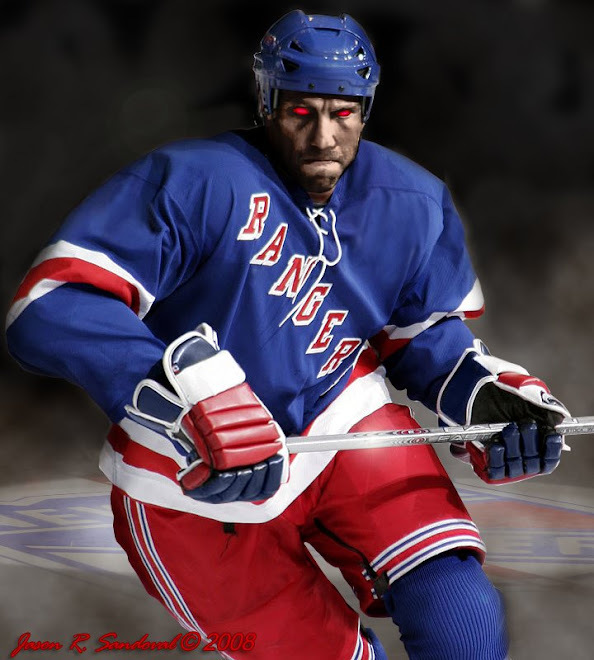 I never thought that Lundqvist could be the reason why the Rangers do not perform in the playoffs....how times have changed. The true hero of the game was our Blueshirt backup Stephen "Vally" Valiquette, who replaced Lundqvist in the second and performed magnificently, stopping 17 of 18 real shots on goal and ultimately stonewalling the Flyers in the shootout. This was his third victory over Philadelphia this season! "Hats off to you, Stephen....as you are more consistent than Henrik these days." Valiquette has proven himself to be a top-shelf goaltender and our dear 1/2-coach Tom Renney should be taking advantage of you more often. I don't recall Lundqvist stealing a game this season, and already you have stolen 'brotherly love' from that city three times this year alone. Huge kudos go to Brendan Shanahan and Nigel Dawes in the shootout with two of the most beautiful shootout goals this season -- additional kudos to 'My Man' Chris Drury who managed again to round out the team and, lastly, a 'pat on the back' to Jaromir Jagr who managed the puck well and let his comrades make the goals and official plays. Our captain is coming around. The Rangers seem to fall apart playing our biggest rival, The NY Islanders, this season -- so tomorrow night should be a heated match -- everyone should be on the lookout for a guest blogger Jibblescribbits, an Avs fan, who will be covering the game and sharing an 'outsider's perspective on two-heated and playoff-hungry rivals. Give him the love he deserves. Henrik is an elite goalie and this happens to every keeper but his inability to steal a game this season is most upsetting. Not sure if we are going to see the king we once relied on. hey dark-don't you think this is just a slump? we have seen lundquist play for two seasons and we have come to rely on him our defense and i have to believe he will get out of this. 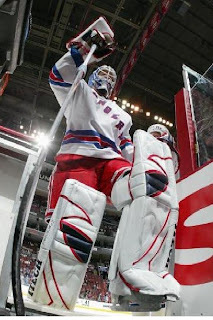 despite what you write in your blog, i still think henrik is the king. HE'S A PAUPER FOR NOW. Top ten goalies always get 'the slump', anonymous...but they get one or two really, really bad games. We have a goalie who recently performs with "you never know what you're going to get". Our team used to be a Dr. Jeckyl/Mr. Hyde, but I am now afraid that with the team playing outstanding hockey and goalscoring, our Henrik goalkeeper has become our Jeckyl & Hyde. I still believe in my Prince but I do notice an alarming habit he has picked up. He now reacts to every little movement instead of playing his usual, you make the first move. I noticed it this year especially in the shootouts. Valley might be a good bet tonight as a head clearing move for the Prince. Strange, that was once our rock is now turning into a problem. 1) Without Chris Simon tonight's game loses something. 2) Wonder if Avery is playing hardball in negotiations with Sather? Sean seems to have found a nice niche in Blueshirtland. he may have forgot already how he wasn't well liked by his last team and it might be better to stay put for a tad less and be happy, or get top dollar and be miserable? pundit...well, Vally sits tonight and Lundqvist is back on. He has played strong against familiar division rivals, so it will be a fair foreshadowing of games to come.